Prof. Kalok Chan is the Dean of The Chinese University of Hong Kong (CUHK) Business School and Wei Lun Professor of Finance. Prof. Chan joined CUHK Business School in November 2014, from his previous role as Chair Professor of Finance and Acting Dean of the Hong Kong University of Science and Technology (HKUST) Business School. Prior to that, he was Head of HKUST’s Finance Department from 2003 to 2013, the Founding Director of the HKUST-NYU Stern Joint Master in Global Finance programme, and had established the Value Partners Centre for Investing. He was Associate Professor of Finance at Arizona State University prior to joining HKUST. Prof. Chan obtained his BSSc in Economics from CUHK, and PhD in Finance from Ohio State University. 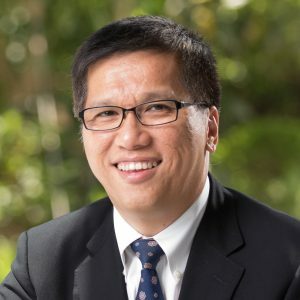 As a leading scholar and a prominent researcher, Prof. Chan has had numerous publications in top ranked finance journals, and has been ranked as the top finance researcher in the Asia-Pacific region by the Pacific-Basin Finance Journal, most recently in 2011. His research interests focus on dynamics of asset prices, derivatives, market micro-structure, and international financial markets. Prof. Chan is active in contributing to the profession. He has been Chairman of the Organising Committee of the HKIB Outstanding Financial Management Planner Awards since 2009. Prof. Chan was also the President of Asian Finance Association from 2008 to 2010, and currently serves as a member of Hang Seng Index Advisory Committee, Hong Kong Housing Authority, EFAC Financial Infrastructure and Market Development Sub-Committee of Hong Kong Monetary Authority, TraHK Supervisory Committee and Advisory Committee of the Securities and Futures Commission. Kalok Chan and Y. C. Chan (2014), “Price Informativeness and Stock Return Synchronicity: Evidence from the Pricing of Seasoned Equity Offerings,” Journal of Financial Economics, 114, 36-53. Kalok Chan, Nusret Cakici, and Kudret Topyan (2014), “Cross-Sectional Stock Return Predictability in China,” European Journal of Finance. Kalok Chan, Ling Cen, Sudipto Dasgupta, and Ning Gao (2013), “When the Tail Wags the Dog: Industry Leaders and Cross-Industry Information Diffusion,” Management Science, 59(11), 2566-2585. Kalok Chan, Allaudeen Hameed, and Wenjin Kang (2013), “Stock Price Synchronicity and Liquidity,” Journal of Financial Markets, 16, 416-438. Kalok Chan and Vicentiu Covrig (2012), “Why Foreign Investors Trade More Frequently?,” Journal of International Money and Finance, 31, 793-817. Kalok Chan and Peter Chung (2012), “Asymmetric Price Distribution and Bid-Ask Quotes in the Stock Options Market,” Asia-Pacific Journal of Financial Studies, 41, 87-102. Kalok Chan, Yiuman Tse, and Michael William (2011), “The Relationship between Commodity Prices and Currency Exchange Rates: Evidence from Futures Markets.” In Commodity Prices and Markets, NBER-EASE, 20, 47-71. Kalok Chan, Vincentiu Covrig, and Lilian Ng (2009), “Home Bias and Firm Value, Evidence from Holdings of Mutual Funds Worldwide,” Journal of International Economics, 230-241. Kalok Chan, Albert J. Menkveld, and Zhishu Yang (2008), “Information Asymmetry and Asset Prices: Evidence from the China Foreign Share Discount,” Journal of Finance, 63, 159-196. Kalok Chan, Kee-hong Bae, and Wai-ming Fong (2008), “International portfolio allocations during the Asian financial crisis: Evidence from U.S. closed-end funds.” In Stock Market Liquidity: Implications for Market Microstructure and Asset Pricing. Kalok Chan and Hung-wan Kot (2007), “Portfolio Concentration and Closed-End Fund Discounts: Evidence from the China market,” Emerging Market Finance, 9, 129-143. Kalok Chan, Hee-Joon Ahn, Jun Cai, and Yasushi Hamao (2007), “Tick Size Change and Liquidity Provision on the Tokyo Stock Exchange,” Journal of the Japanese and International Economies, 21, 173-194. Kalok Chan, Albert J. Menkveld, and Zhishu Yang (2007), “The informativeness of domestic and foreign investors’ stock trades: Evidence from the perfectly segmented Chinese market,” Journal of Financial Markets, 10, 391-415. Kalok Chan and Allaudeen Hameed (2006), “Stock Price Synchronicity and Analyst Coverage in Emerging Markets,” Journal of Financial Economics, 80, 115-147. Kalok Chan and Hung-wan Kot (2006), “Price Reversal and Momentum Strategies,” Journal of Investment Management, 4, 70-89. Kalok Chan and Johnny Kwok (2005), “Market Segmentation and Share Price Premium: Evidence from Chinese Stock Markets,” Journal of Emerging Market Finance, 4, 43-61. Kalok Chan, Vincentiu Covrig, and Lilian Ng (2005), “What Determines the Domestic Bias and Foreign Bias? Evidence from Mutual Fund Equity Allocations Worldwide,” Journal of Finance, 60, 1495-1534. Kalok Chan, Yue-cheong Chan, and Wai-ming Fong (2004), “Free Float and Market Liquidity: Evidence from Hong Kong Government’s Intervention,” Journal of Financial Research, 27, 179-197. Kalok Chan, John K. C. Wei, and Junbo Wang (2004), “Under-pricing and Long-term Performance of IPOs in China,” Journal of Corporate Finance, 10, 409-430. Kalok Chan, Kee-hong Bae, and Angela Ng (2004), “Investability and Return Volatility in Emerging Equity Markets,” Journal of Financial Economics, 71, 239-263. Kalok Chan, Allaudeen Hameed, and Sie-ting Lau (2003), “What If Trading Location is Different from Business Location? Evidence from Jardine Group Trading,” Journal of Finance, 58, 1221-1246. Kalok Chan, Peter Chung, and Wai-ming Fong (2002), “The Informational Role of Stock and Option Volume,” Review of Financial Studies, 15, 1049-1075. Kalok Chan, Hee-Joon Ahn, and Kee-hong Bae (2001), “Limit Orders, Depth, and Volatility, Evidence from Stock Exchange of Hong Kong,” Journal of Finance, 56, 767-788. Kalok Chan, Warren Bailey, and Peter Chung (2000), “Depository Receipts, Country Funds, and the Peso Crash: The Intraday Evidence,” Journal of Finance, 55, 2693-2717. Kalok Chan, Mark Chockalingam, and Wan Lai (2000), “Overnight Information and Intraday Trading Behaviour: Evidence from NYSE Cross-Listed Stocks and their Local Market Information,” Journal of Multinational Financial Management, 10, 495-509. Kalok Chan and Wai-ming Fong (2000), “Trade Size, Order Imbalance, and the Volatility-Volume Relation,” Journal of Financial Economics, 57, 247-273. Kalok Chan, Allaudeen Hameed, and Wilson Tong (2000), “Profitability of Momentum Strategies in the International Equity Markets,” Journal of Financial and Quantitative Analysis, 35, 153-172. Kalok Chan, Kee-hong Bae, and Yan-leung Cheung (1998), “Bid-Ask Spread and Arbitrage Profitability: A Study of the Hong Kong Index Futures and Options Market,” Journal of Futures Market , 18, 743-763. Kalok Chan and Hank Bessembinder (1998), “Market Efficiency and the Returns to Technical Analysis,” Financial Management, 27(2), 5-17. Kalok Chan, Grant McQueen, and Steve Thorley (1998), “Asian Stock Market Bubbles,” Pacific-Basin Finance Journal, 6, 125-152. Kalok Chan, Hank Bessembinder, and Paul Seguin (1996), “An Empirical Examination of Information, Differences of Opinion, and Trading Activity,” Journal of Financial Economics, 40, 105-134. Kalok Chan, Peter Chung, and Herb Johnson (1995), “Intraday Bid-Ask Spread Pattern in the Stock and Option Market,” Journal of Finance and Quantitative Analysis, 30, 329-346. Kalok Chan and Peter Chung (1995), “Vector Autoregression or Simultaneous Equations Model? The Intraday Relationship Between Index Arbitrage and Market Volatility,” Journal of Banking and Finance, 19, 173-179. Kalok Chan and Hank Bessembinder (1995), “The Profitability of Technical Trading Rules in the Asian Stock Markets,” Pacific-Basin Finance Journal, 3, 257-284. Kalok Chan, Peter Chung, and Herb Johnson (1993), “Why Option Prices Lag Stock Prices: A Trading-Based Explanation,” Journal of Finance, 48, 1957-1967. Kalok Chan (1993), “Imperfect Information and Cross-Autocorrelation Among Stock Prices,” Journal of Finance, 48, 1211-1230. Kalok Chan and Peter Chung (1993), “Index Arbitrage, Spot and Futures Price Volatility, and Spot Market Volume: A test with Intraday Transactions Data,” Journal of Banking and Finance, 17, 663-688. Kalok Chan and Yue-cheong Chan, “Price Volatility in the Hong Kong Stock Market: A Test of the Information and Trading Noise Hypothesis,” Pacific-Basin Finance Journal, 1, 189-201. Kalok Chan and Hank Bessembinder (1992), “Time Varying Risk Premia and Forecastable Returns in Futures Markets,” Journal of Financial Economics, 32, 169-193. Kalok Chan (1992), “A Further Analysis of the Lead-lag Relationship Between the Cash Market and Stock Index Futures Markets,” Review of Financial Studies, 5, 123-152. Kalok Chan, K. C. Chan, and Andrew Karolyi (1998), “Intraday Volatility in the Stock Market and Stock Index Futures Market,” Review of Financial Studies, 4, 657-684. Kalok Chan (1997), “Asian Money Markets,” Journal of Comparative Economics, 24, 362-364. Kalok Chan, Andrew Karolyi, and Ghon Rhee (2002), “A Retrospective Evaluation of the Pacific-Basin Finance Journal, 1993–2002,” Pacific-Basin Finance Journal, 10, 497-516. Kalok Chan, Hung-wan Kot, and Sophie X. Ni, “Does Option Trading Affect the Return Predictability of Short Selling Activity?“. Kalok Chan, Jiangze Bian, Donghui Shi, and Hao Zhou, “Do Behavioural Biases Affect Order Aggressiveness?“. Kalok Chan, Hung-wan Kot, and Zhishu Yang, “Effects of Short-sale Constraints on Stock Prices and Trading Activity: Evidence from Hong Kong and Mainland China“. Kalok Chan, Jian Yang, and Yinggang Zhou, “Global Currency Hedging: Evidence from Conditional Coskewness and Cokurtosis“. Kalok Chan, Baolian Wang, and Zhishu Yang, “Why Investors Do Not Buy Cheaper Securities? An Analysis of Trading by Individual Investors in Chinese Stock Market”. Kalok Chan, Chuan-yang Hwang, and Mujtaba Mian, “Mutual Fund Herding and Dispersion of Analysts’ Earnings Forecasts“.